Antiquities officials have decided to add the Menasce Synagogue in Alexandria to the national heritage list of Islamic, Coptic and Jewish monuments. 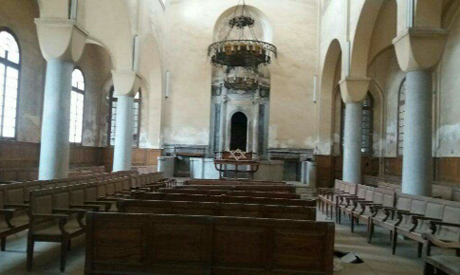 According to Mohammed Metwali, general director of antiquities in Alexandria, the synagogue was built by philanthropist Baron Yacoub de Menasce in 1860. The decision by the Supreme Council of Antiquities’ board of directors comes after inspection and investigation of the synagogue’s architectural and archaeological conditions. Mohamed Abdel-Latif, a deputy minister of antiquities and head of the Islamic, Coptic and Jewish Antiquities Department within the ministry, told Ahram Online that the decision came within the framework of the ministry’s keenness to add all Egyptian monuments to the country’s heritage list, regardless of era or religious affiliation. “All the monuments, whether ancient Egyptian, Jewish, Coptic, Islamic, on Egyptian land are the country’s properties and unique heritage,” he said. Abdel-Latif explained that the registration of the synagogue, which is located in El-Manshia Square, will make it an official historical site under the antiquities protection law, law no. 117 of 1983, and under its amendments in law no. 3 of 2010. This legislation guarantee the ministry’s full responsibility for and protection of the site. The decision comes after the Permanent Committee of Islamic Antiquities reviewed the scientific reports submitted by the archaeological committee which inspected the synagogue and noted its good architectural condition. The rectangular-shaped building is surrounded by a stone wall with a decorative element. The main façade of the synagogue has two rows of windows and the interior is divided into two sections. The floors are paved with ceramic tiles, while the ceilings have domed shapes. Menasce was the first of four Menasce men who headed the Alexandrian Jewish community.